NASA's Voyager 2 space probe, launched in 1977 on a grand tour of the solar system, may be nearing interstellar space. 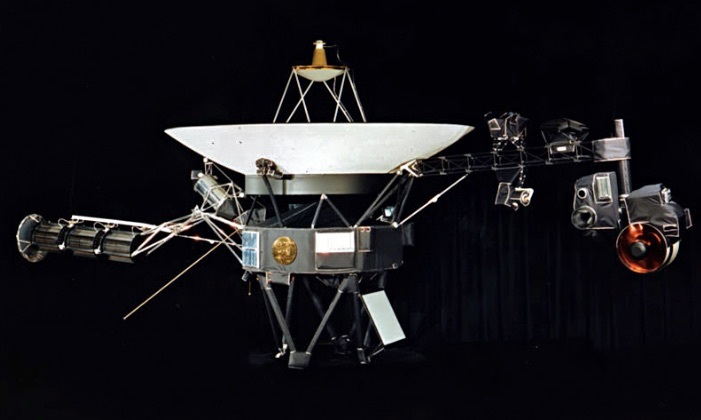 Carrying a message for extraterrestrials, the iconic Golden Record, the Voyager 2 is now about 11 billion miles (about 17.7 billion kilometers) from Earth and still sends data back daily from its various sensors. Most recently, it has detected an increase in higher-energy cosmic rays that originate outside our solar system. This increase in the rate of cosmic rays indicates that the Voyager 2 may soon break through the heliosphere, the "bubble" of charged particles generated by our sun, and cross into interstellar space. Voyager 1 entered interstellar space in 2012. The fact that Voyager 2 may be approaching the heliopause six years after Voyager 1 is also relevant, because the heliopause moves inward and outward during the Sun's 11-year activity cycle. Solar activity refers to emissions from the Sun, including solar flares and eruptions of material called coronal mass ejections. During the 11-year solar cycle, the Sun reaches both a maximum and a minimum level of activity. "We're seeing a change in the environment around Voyager 2, there's no doubt about that," said Voyager Project Scientist Ed Stone, based at Caltech in Pasadena. "We're going to learn a lot in the coming months, but we still don't know when we'll reach the heliopause. We're not there yet -- that's one thing I can say with confidence." In a decade or so, Voyager 1 and 2 will run out of power and go silent. But they will still continue their journeys, drifting among the stars in orbit within our Milky Way essentially forever or until they're intercepted, an unlikely but certainly possible event. We may never know whether an extraterrestrial civilization ever listens to the Golden Record. It was a gift from humanity to the cosmos. But it is also a gift to humanity. The record embodies a sense of possibility. The Golden Record, and the Voyagers carrying the disks, are a reminder of what we can achieve when we are at our best -- and that our future really is up to all of us. The Voyager Golden Record 3xLP Vinyl Box Set and 2xCD-Book edition is now available from Ozma Records.